Not everyone gets the opportunity to try some of France’s most famed wines before their tenth birthday. While growing up in France’s Northern Cote du Rhone, Serge Laville did just that, thanks to his grandfather, a wine connoisseur with a cellar many would envy. Little did Grandpere–or Serge himself– know that Serge would grow up to create highly sought after and acclaimed wines halfway around the world as the winemaker at Spring Valley Vineyard. As a young adult in France, Serge worked as a photographer, but the early training in his grandfather’s wine cellar, as well as an educational background in chemistry and biology, led him back to enology. He began studying with famed wine consultant Marie Laure Sylvestre, making yearly visits to various wine regions in France and learning the intricacies of terroir, aging, and tasting, and after a decade decided to become a wine tourist in the United States. 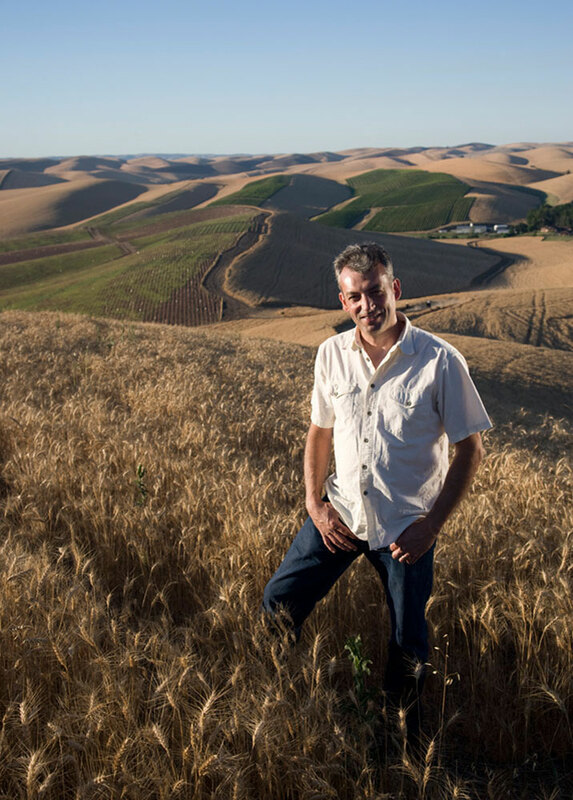 In 2000, armed with a camera and backpack, he set out on a journey that eventually brought him to Walla Walla and a chance meeting with fellow photographer and Spring Valley Vineyard founding winemaker Devin Corkrum Derby, who invited him to Spring Valley Ranch. Serge fell in love with the wines Devin was making, as well as the beautiful old homes and magnificent scenery of the Walla Walla Valley. He also met Walla Walla native Madeleine Call and the rest, as they say, is history. After several trips back and forth between Walla Walla and France, Serge made two big decisions: one to ask Madeleine to marry him, and the other to take Devin up on his offer to become his assistant in the winery at Spring Valley. Serge started working at the ranch during the 2002 harvest and quickly mastered the unique and special attributes of the vineyard and winemaking style at Spring Valley. “I learned winemaking in France,” he says, “but I learned how to make Washington wine from Devin Derby.” The two discovered they shared a philosophy of “listening to the vineyard” and allowing nature to take its course in the winemaking process with minimal, careful intervention including picking, sorting, and punching down the wines gently by hand. When Devin died in 2004, Serge quietly tended the wines despite his own grief at the loss of his close friend, and soon made the decision to stay at the winery and continue the legacy of Devin and the winery. He has been Spring Valley’s Winemaker since 2005. To this day, Serge crafts each wine with the care and attention that is the tradition of Spring Valley Vineyard. And in the tradition of his family, Serge and Madeleine’s daughters Claire and Anna are already at home in the vineyards and the winery at Spring Valley.